If your idea of a perfect steak is crusty on the outside, grilled to a uniform rare to medium-rare, masterfully seasoned with a hint of wood smoke, and tantalizingly juicy when you cut into it, listen up. There’s a new grilling method you’ve probably never heard of. The secret? A cold grate. Cold grate grilling is a two-step process that begins with what is called the reverse-sear method, where meat is slowly warmed and/or smoked to an internal temperature of 110 to 115 degrees, then seared over a hot fire. But instead of being branded on a screaming hot grill grate, the grate itself is rotated at one-minute intervals and the meat is repositioned. That way, the meat always rests on relatively cool grill rungs during its sizzling trip over live coals. If you’ve deduced that cold grate grilling sacrifices the sharp grill marks I’ve been championing for years, you are right. However, the entire surface of the meat—not just the crosshatch pattern—is uniformly caramelized for maximum flavor. So while I still believe food with grill marks is Instagram-worthy, I’m willing to concede flame-caramelized food makes a lot of sense to your palate. Do you need special equipment? At a minimum, you’ll need a kettle-style grill that’s large enough—preferably 22 inches in diameter—to accommodate 2-zone grilling. 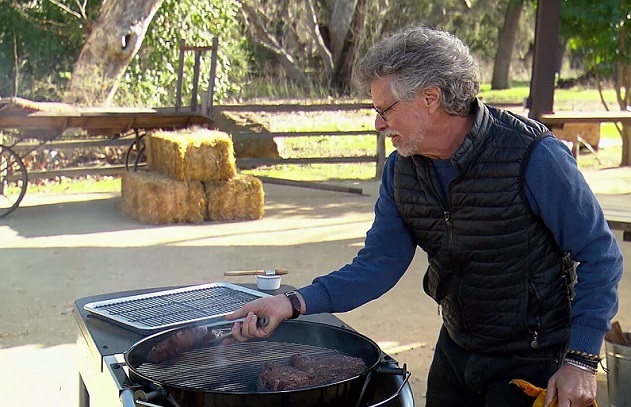 For the filming of Episode 101, “Steak and Beyond,” we used two innovative products from ABC—both developed by David. The first is called a Slow ’N Sear®, a stainless steel charcoal corral with a built in water reservoir that effectively turns a standard kettle grill into a smoker. Designed to fit snugly against the wall of the firebox, the Slow ’N Sear® can coax a wide range of temperatures from common charcoal briquettes; it can smoke low and slow or cook indirectly for hours, or as the name suggests, sear at temperatures in excess of 1000 degrees. Steakhouse worthy temperatures, in other words. 1. Prep the steaks: Buy the best meat you can find, preferably grass-fed, organic Prime or Choice with generous marbling. Each steak should be at least 1 1/2 inches thick. 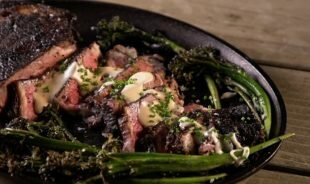 (Our source for rib-eyes for the show was Creekstone Farms.) Season the steaks on both sides with kosher salt, then place on a wire rack over a rimmed baking sheet. Refrigerate for 1 hour, or up to overnight. 2. 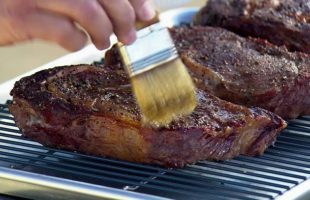 Using paper towels, blot any accumulated moisture off the steaks; a dry surface will promote browning and is key to achieving a good crust. 3. Set up your kettle grill for smoking by placing a chimney of natural lump charcoal or charcoal briquettes in the Slow ’N Sear®, a charcoal basket, or in a shallow pile on the lower grate near the wall of the firebox. (David prefers briquettes over natural lump charcoal as they burn more predictably.) If using the Slow ’N Sear®, fill the water reservoir with hot water. Adjust the vents to maintain a grill temperature of 225 to 250 degrees. Place the grill grate on the grill. 4. Arrange the steaks on the cool side of the grill. 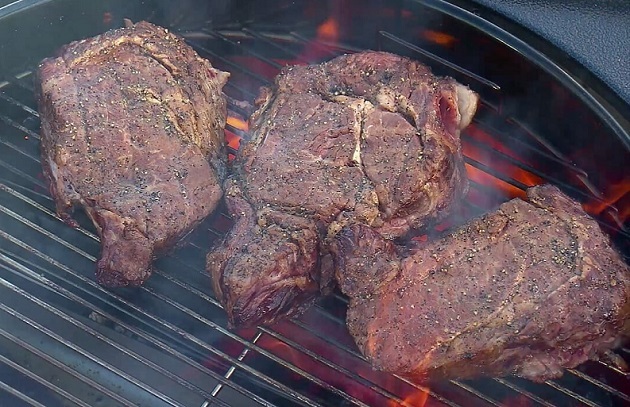 Ideally, you’ll be using a digital remote thermometer to monitor the temperature of the grill and the steaks. Add 2 or 3 wood chunks to the coals through the hinged charcoal access door to generate smoke. Close the lid and smoke the steaks until the internal temperature on the remote or an instant-read thermometer reads 110, about 1 hour. After 40 minutes, light another chimney of charcoal in preparation for searing. Make the Anchovy Cream, if desired, and keep warm. 5. Remove the steaks and the grill grate from the grill and set aside. Add the newly lit charcoal to the pile and allow the fire to develop its full heat potential. In the meantime, brush the steaks on both sides with extra virgin olive oil and season generously with freshly and coarsely ground black pepper. 7. Transfer the steaks to a warmed platter or plates. Serve, if desired, with the Anchovy Cream. And dig in!